Some years back, The Syndicate adopted YOU as our group charity. We have been holding an annual charity raffle to support them every year since then. YOU is an outstanding organization focused on helping kids stay off the streets and get the kind of mentoring and support they need. We are proud of our support for them. The raffle is sponsored by various gaming developers and the items are bid on by Syndicate members attending our annual conference. This year's raffle had both $5 tickets for larger items and $1 tickets for more than 100 other items. 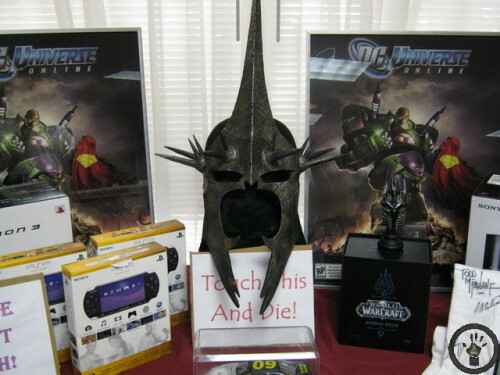 Among the items in the $5 raffle were a replica metal Witch King helm from the Lord of the Rings movie, Play Station 3's, Play Station Portables, a Lich King Helm from World of Warcraft, signed (By Jim Lee) and framed posters of DC Universe Online, a signed TShirt by Curt Schilling, Todd McFarlane and RA Salvatore and a custom built Syndicate themed NASCAR in a hand built case. Among the items in the $1 raffle were TShirts from a myriad of different games, copies of many games, Prima guides, water bottles, mugs, caps, backpacks, and much more. Sponsors for this year's conference included: SOE, Blizzard, 38 Studios, Second Skin, Microsoft, Dell, Alienware, Codemasters, Flying Lab, Activision, Playxpert, Bioware, Realtime Worlds, Prima Games, Turbine, Funcom, Hi-Rez Studios, KingsIsle, Icarus Studios and Electronic Arts. When all was said and done... and the winners picked... and proceeds counted... a good sum was raised for charity. That is a big boost over our total last year and is amazing considering the tough economic times of 2009. We would like to give special thanks to all of our sponsors for making this raffle possible! Here are some pictures of just some of the items in the raffle. There was so much awesome stuff that even a distant shot of the tables cannot get it all in the frame.